Ichthyosis vulgaris (ik-thee-O-sis vul-GAY-ris) is an inherited skin disorder in which dead skin cells accumulate in thick, dry scales on your skin’s surface. 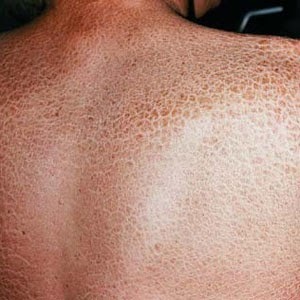 The scales of ichthyosis vulgaris, sometimes called fish scale disease or fish skin disease, can be present at birth, but usually first appear during early childhood. Sometimes, mild cases of ichthyosis vulgaris go undiagnosed because they’re mistaken for extremely dry skin. Most cases of ichthyosis vulgaris are mild, but some are severe. Sometimes other skin diseases, such as the allergic skin condition eczema, are associated with ichthyosis vulgaris. No cure has been found for ichthyosis vulgaris, and treatments focus on controlling the condition. Ichthyosis vulgaris is one of the most common of the inherited skin disorders. It may begin in early childhood. The condition is inherited in an autosomal dominant pattern. That means you only need to get the abnormal gene from one parent in order for you to inherit the disease. The condition is often more noticeable in the winter. It may occur along with atopic dermatitis, asthma, keratosis pilaris (small bumps on the back of the arms), or other skin disorders. The dry, scaly skin is usually most severe on the legs. But it can also involve the arms, hands, and middle of the body. Persons with this condition may also have many fine lines on the palm of the hand. Your doctor will recommend heavy-duty moisturizers. Creams and ointments work better than lotions. Apply these to moist skin immediately after bathing. You should use mild, non-drying soaps. Your doctor may tell you to use hydrating-moisturizing creams that contain keratolytic chemicals such as lactic acid, salicylic acid, and urea. These chemicals help skin shed normally. A bacterial skin infection may develop if scratching causes openings in the skin. Women with Vulvodynia: Who Has It?